US Defense Secretary Ashton Carter. New Delhi, Dec 8 (IANS) Taking bilateral security ties to a new high, the US on Thursday designated India as its “Major Defence Partner”. 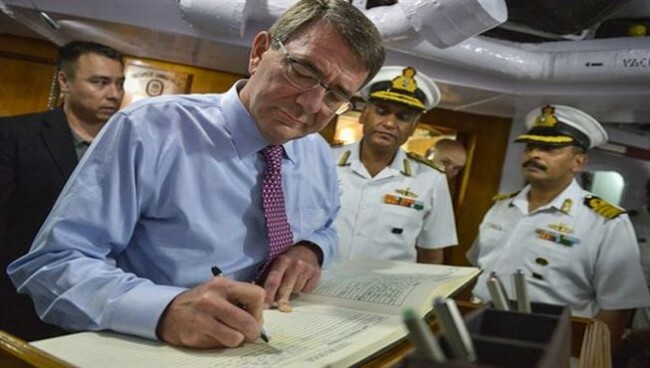 The designation took place as US Defense Secretary Ashton Carter met Indian Defence Minister Manohar Parrikar — the seventh meeting between the two — here. The two sides also discussed terrorism and agreed to strengthen counter-terror cooperation. “The designation of a ‘Major Defence Partner’ is a status unique to India and institutionalises the progress made to facilitate defence trade and technology sharing with India to a level at par with that of the United States’ closest allies and partners,” said a joint statement issued after the meeting. The move also aims at ensuring an enduring cooperation in the future, it added. Parrikar and Carter in their meeting reviewed the progress made in the bilateral defence ties and discussed the immense promises for the future of India-US security cooperation. “Both sides exchanged views on regional security issues including the threat posed by terrorism. They agreed to continue further strengthening the bilateral counter-terrorism cooperation and underlined the need to ensure that terror groups receive no patronage from any state,” the joint statement said. India has pointed fingers at Pakistan repeatedly for waging a proxy war on India through terrorists trained on its soil. The statement, however, did not name Pakistan. Citing common values and “our shared desire for peace and prosperity in the Asia Pacific and Indian Ocean region”, the two leaders reflected on “the convergence of interests that have driven the strategic and technological ‘handshakes’ between the two nations, and led to historic progress in our bilateral relationship”, the statement said. India and the US have moved closer in defence cooperation in the recent years. The agreements between the two countries includes the signing of a Defence Framework Agreement in 2015, which laid out a blueprint for collaboration between the defence establishments and enabled deeper cooperation. “Joint exchange opportunities — in both personnel and training exercises — have expanded and strengthened our bilateral cooperation. The recent signing of the Logistics Exchange Memorandum of Agreement (LEMOA) has facilitated additional opportunities for practical engagement and exchange,” the statement said. Parrikar and Carter also applauded the deepened scope of India-US military-to-military ties, which includes increase in defence trade. With regard to technology, both sides welcomed the tremendous progress achieved under the Defence Technology and Trade Initiative (DTTI) and committed to explore new proposals and other innovative opportunities for co-production and co-development. “The emergence of the DTTI as an integral and enduring component of India-U.S. security cooperation is a sign that the relationship has matured to a level of strategic importance. “The DTTI will strengthen India’s ‘Make in India’ initiative and both sides committed to convening all new DTTI working groups prior to the next DTTI Group meeting anticipated for February 2017,” the statement said. The two leaders also agreed that the “strong partnership between our countries is lasting and will thrive and grow for decades to come”.